Security installers and home owners can add Smart Home features and Internet monitoring to DSC alarm systems, using the new Envisalink 2DS module. New and existing alarm systems can be monitored and controlled using any Internet enabled iPhone, Android or Blackbery phone. Security installers and home owners can now add Smart Home Monitoring features and optional Internet based monitoring to their new or existing DSC® Powerseries alarm systems with the new Envisalink 2DS from Eyez-On Corporation. Envisalink users can check on their systems any time and can arm or disarm their alarm using Internet enabled smart phones including iPhones, Android phones and Blackberry phones. The Envisalink 2DS connects quickly and easily to new and existing DSC Powerseries alarm systems to provide alarm status and history, remote arming and disarming, as well as e-mail or text alerts. The Envisalink can co-exist with the user or installer's current monitoring service or it can be used to provide Internet based monitoring or self monitoring options. The Envisalink 2DS provides an extra level of security and peace of mind by allowing the owner to make sure their home, cottage or business is properly secured. They can also easily disarm the system remotely to allow family, friends, contractors or staff to enter without having to give out security codes. Or if the alarm is forgotten, they can conveniently arm it any time. An optional Internet based monitoring service provides a full UL listed monitoring option for a very low monthly fee, for Envisalink 2DS customers in Canada and the USA. In addition, Eyez-On have recently released an API allowing third party automation and smart phone developers to write custom software for the Envisalink 2DS, making the system even more versatile. Aartech Canada Inc. is a rapidly growing, fully Canadian owned and operated distributor of home automation and security products based on Oshawa, Ontario. 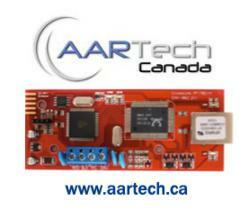 Aartech Canada’s business continues to be built on a strong commitment to customer service and a desire to offer unique, high quality and exciting products to Canadian customers with local Canadian support. Eyez-On Corporation specializes in delivering security and location-based services and products in IP environments.